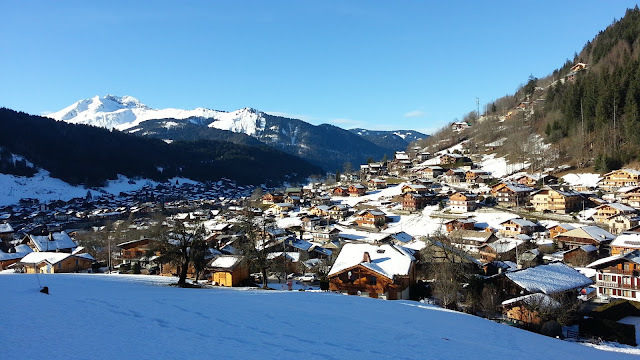 Happy New Year from the French Alps! We are nearing the end of a wonderful first ECS ski trip in the French Alps. The weather has been kind and today is a classic alpine day with fresh snow on the ground, bright sun and clear blue skies. The arrangements have all worked out fine. The pupils taking lessons have made fantastic progress and this morning are skiing with their instructors up to Switzerland to enjoy the high mountain views. The advanced skiers have also been having a great time ranging across the Port du Soleil and especially enjoying the ski parks in Avoriaz. The chalet has been great and we will certainly use it again. Everyone has enjoyed games around the fire over canapés in the evening. The food has surpassed all our expectations. The children have thoroughly enjoyed the hot tub too! On New Year's Eve a group went in to Morzine and enjoyed a spectacular torchlight procession down the mountain followed by a firework display. We have two days of skiing left and I will stop now and get back onto the slopes! Lots of photos and videos will follow over the next couple of weeks.